I’d be pissed off if I were Holly Madison right about now, too. Half of $43 Million is a lot of money…. This week, Stephen Colbert kinda sorta donated $26,000 to donorschoose.org in “his new best friend for six months” Jimmy Fallon’s name without his knowledge or permission. Jimmy responded by promising that Stephen would come on his show and sing “Friday” by Rebecca Black if his viewers were able to raise the $26,000 donation, which they did, quickly. Above is the glorious mess that resulted, featuring The Roots and Taylor Hicks! Party-in, party-in yeah! Fun, fun, fun, fun….Ok, I’ll stop now. The autopsy of Knut, the world-famous polar bear, has revealed that his immediate cause of death was drowning. Knut passed away suddenly and unexpectedly on March 19th, 2011 in front of hundreds of zoo-goers when he suddenly collapsed into the water of his enclosure. It has been found that his collapse was due to encephalitis, which is swelling of the brain caused by infection. Knut achieved international fame when he was born at the Berlin zoo in 2006 and rejected by his mother. Amid controversy with animal rights organizations, the zookeepers rescued Knut from his enclosure and raised him. His primary caregiver was Thomas Dörflein, who passed away from a heart attack in 2008 at the age of 44. 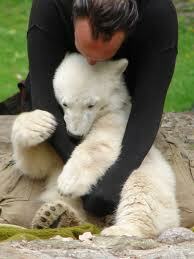 Knut was the first polar bear to be born at the Berlin Zoo and survive past infancy in more than 30 years. It seems like they are running on a lot of recurring jokes from the first movie, but who am I kidding? I’ll totally go see it find it on megavideo when it’s released on dvd. Check out the trailer above!